NUSA DUA, BALI, INDONESIA, August 21, 2018 /EINPresswire.com/ — Well known as the island of the Gods, Bali could just as well be called the island of love, thanks to its palm fringed beaches, dramatic sunsets, emerald green rice paddies and ornate Hindu temples. So, if your idea of a romantic escape involves a stunning tropical resort on an island paradise, The Ritz-Carlton, Bali beckons. “With a beautiful setting on a private bay at the bottom of soaring limestone cliffs, The Ritz-Carlton, Bali is a romantic idyll straight out of a fantasy,” says General Manager Karim Tayach. From the moment you arrive you will fall under the spell of this enchanting beachfront resort that is infused with more than a touch of Bali magic. The Ritz-Carlton Spa is the perfect place to relax and unwind. 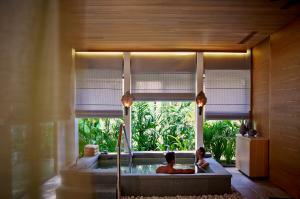 Experience the signature Escape to Romance spa treatment in a private spa villa for two. A foot ritual, Balinese massage and body exfoliation will leave you feeling radiant, but there is more to come as you slip into a Luster Pearl Aromatic bath, enjoyed with Champagne and Chocolates. As day turns to night take a barefoot stroll on the white sand beach and bask in the golden light of dusk. Or perhaps salute the setting sun with a signature cocktail high on the terrace at Bejana Restaurant, which clings to the cliff top offering endless ocean views. Once darkness descends, enjoy the balmy tropical evening as you dine in a private gazebo on the sand just meters from the Indian Ocean. Specially-crafted menus from the resort’s award winning chef make the perfect indulgence, accompanied, of course with Champagne. 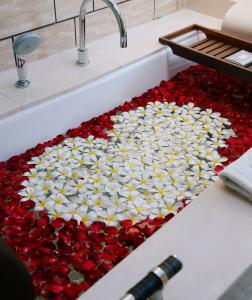 After a nightcap at The Ritz-Carlton Lounge and Bar return to your beautifully-appointed suite or villa to find your bathtub filled with rose petals. With a dramatic setting on Bali’s majestic east coast, The Ritz-Carlton, Bali is blessed with the most stunning sunrises. 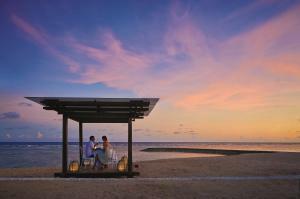 Wake up to this special moment with a tropical breakfast at a private gazebo by the beach. 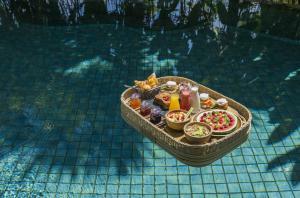 Guests staying in villas and pool access suites can also treat themselves to a novel Floating Breakfast, served on a customized tray that floats on the water. Or perhaps start your day with a Sunrise yoga class. Feel the gentle morning sun on your face and the ocean breeze in your hair as you stretch towards the rising sun. 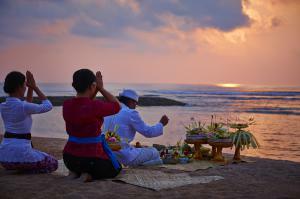 Opt for a unique Balinese Soul Purification Ritual that takes place on the beach at sunrise. A Balinese priest will lead your spiritual journey which includes an offering of devotion and a ritual with holy water to symbolically cleanse the body, mind and soul. If you are craving adventure our concierge will be delighted to organize a private land tour for you, taking in some of the incredible sites on the island. Explore remote jungle temples, discover wild surf beaches and visit the steeply terraced emerald green rice fields that Bali is famous for. Of course romantic journeys aren’t always about ‘doing’, sometimes they are just about ‘being’, and our suites and villas make perfect lovers retreats. For the ultimate indulgence choose one of our elegant cliff top villas set amidst lush gardens with panoramic ocean views. Whether you are looking for the perfect honeymoon hideaway, fun activities for two, or simply wanting to soak up the sun and the spirit of Bali, romance abounds at The Ritz-Carlton, Bali.